I am participating in the Quilter’s Blog Hop Party Give Away. Visit the 175 quilting blogs participating in the Quilter’s Blog Hop Party. You can register on each blog for their giveaway. If you have been following along you know that at the end of this week there will be a drawing from my blog for a give away that includes my pattern “Holiday Moments”,( PEACE is one of the patterns in Holiday Moments) the Winter Special fabric kit and a spool of my favorite Red Madeira thread. This is my thank you for being loyal blog followers all year long. 1) Leave one comment, one only, telling me which New Year’s Resolution you kept this year? If you didn’t keep one, which one do you’d wish you kept? One of my New Year Resolutions was to change my needle for every new project I started…a very practical resolution and one that was very easy to keep. I did manage to stick to that resolution, mostly…and there were no guilt trips if I didn’t do it straightaway. I’m looking forward to reading your stories! Let’s look at what you need to do next in making PEACE. We have marked our circle on the red background fabric. We have cut out our trees with a pinking decorative blade. Now we need to make the rest of the trees. Fuse an 8” square fabric for your trunks. I used a purply blue for mine. Remove the paper from the fused fabric. Place the fused fabric fusing side up on the back side of your rotary mat and using a wavy decorative blade in your 45m rotary cutter, cut from corner to corner on the diagonal to make trunks for your trees. I make my trunks about a 1/2” wide at the bottom to narrower at the top. Place all of your triangle trees back onto a piece of release paper and tack fuse them in place. Place a trunk down the center of each tree and trim it to about 1 inch beyond the bottom of the tree. Using a hot dry iron press the trunks in place. Fuse a darker 8” square of green fabric . Cut apart the dark green strips into leaf shapes and place three on each tree. Press in place. Fuse a 5” square of red or fuchsia fabric and cut it into small squares. From the small squares cut out small circles using very sharp KAI scissors. Place three on each tree and press in place. Well , my resolution was to finish some UFOs ,,, it lasted till April , then I started new ones , quilts , now I have to finish them !!!! My chosen inspiration word was “focus”. This has been very helpful in my quilting life. I have been able to finish up several UFO’s this year…YIPEE. My resolution was to conquer my fears about FMQ and finish some UFO’s that had been hanging around. I quilted and finished a tree skirt for our tree this year, I’m binding a quilt I had long arm quilted for my sister last year. And I’m finishing the quilting on a Christmas themed quilt that I started last year as well. That will only skim the surface for my UFO pile, but it’s a start. 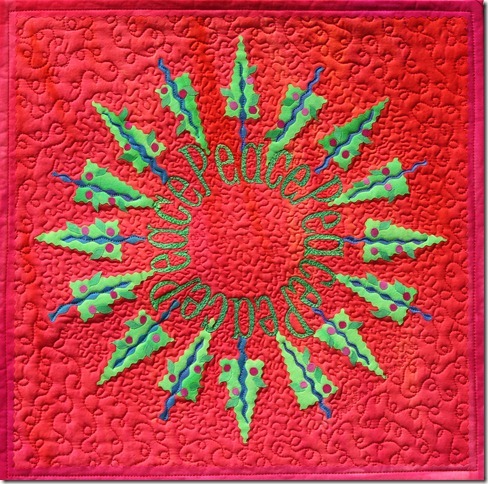 I love your peace tree quilt! Your Peace piece is just lovely. Thanks for the tutorial on making it. One of my resolutions was to practice more FMQ and I finally moved from practice pieces to a real quilt. It wasn’t too bad either. I love seeing those little trees come to life! Thanks for sharing all of the steps of making the little trees! One of my resolutions is to continue to try new techniques and keep learning. Thanks for the Peace tutorial! My resolution of finishing many UFO’s was kept, because I didn’t designate a number! I resolved to maintain a 55 lb. weight loss by sewing. I did that. I started several projects and vowed I would finish them in 2012 and I did!!! !love the peace tree! My resolution was to loose weight. I’m 5’4″ tall and used to weigh 195#. I started hiking two miles a day with my dog and in six months my weight dropped to 140#. Whoo-Hoo! I think it is the first time I kept a New Year’s resolution. My resolution for 2013 is to lose weight before February. Oh….finish those ufo’s. Seems like that’s my resolution every year…lol. To learn a new technique. And I took your class to learn a new way to do applique. Thanks for the tutorial.